Clifford Sorita, a sociologist who presented the study revealed that the reason why Filipinos appear to be not interested in having a Church wedding might be the perception that getting married in churches is expensive. Out of 2,500 respondents 57.7 percent did not have a Church wedding. Of the number, 7.5 percent said their marriage vows were not solemnized by a priest while another 50.2 percent gave no answer because they are too shy and not comfortable of admitting that they are married. The survey also revealed that those belonging to monthly salary income of P25,000 pesos and above, 51 percent were able to get married in churches; followed by 45 percent with monthly salary income of P15,000 to P24,999 pesos; 42 percent with a monthly salary income of P5,000 to P14,999 pesos; and 47 percent with a monthly salary income of P4,999 pesos and below. While it is true that people perceived church wedding as expensive because of the fanciful events and functions that comes along with it, most people opt for civil wedding instead that of church for economic reasons while others opt to delay any church wedding plans until such time their financial situations improve. 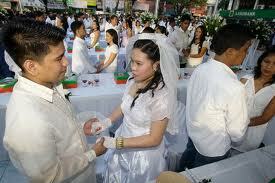 To alleviate the problem local government units (LGUs) in some regions of the country have been sponsoring mass wedding ceremonies or Kasalang Bayan intended not only for the poor couples but also to those who failed to make them despite their plans.